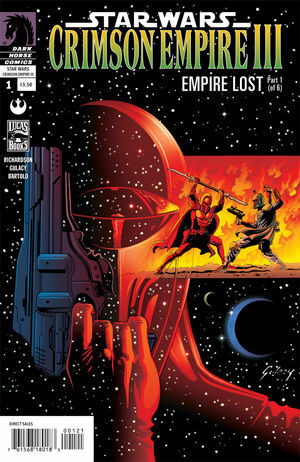 Originally released by Dark Horse Cmis in 1999, this trade paperback collects Star Wars: Crimson Empire #1-6 from the creative team of Mike Richardson, Randy Stradley, Paul Gulacy, P. Craig Russell, Sean Konot, Dave Stewart, and Dave Dorman. In another part of the galaxy, a former Imperial Guardsman turned bounty hunter, Kir Kanos, is ready to settle an old score after three years in hiding--if a new adversary doesn't kill him first! * The original creative team returns!